Former Stags defender Luke Jones has bowed to the inevitable and finally announced his retirement due to his long-term Achilles tendon injury. 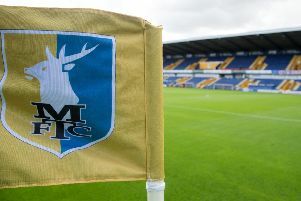 Jones, 28, returned to Stags for a third spell in summer 2014, but a pre-season injury failed to clear, despite a succession of operations and treatments and his main goal now it to make sure he can walk in the future. “I spoke to Luke the other day and I think he is going to look at retiring now,” said boss Adam Murray. “It’s been a nightmare for him. He hasn’t walked properly for 18 months/two years, so the first port of call is walking. “The longer term picture, if anything, is if it goes wrong again, it might affect his ability to even walk. Jones started his career at Blackburn Rovers without making any first-team appearances, though had a loan spell with Cercle Brugge of the Belgian First Division. He was released by Blackburn in the summer of 2006 and, after a brief spell at Ashton United, joined League Two side Shrewsbury Town in November 2006. From there he was loaned out to Conference National club Kidderminster Harriers and signed for them on a permanent basis ahead of the 2008–09 season when he established a regular place. After a year at Kidderminster, he spent one season at Mansfield, scoring twice in 24 starts, before becoming Forest Green Rovers’ club captain for the 2010/11 campaign. He returned to Kidderminster the following season, and then re-joined the Stags in June 2012. This time he helped the club to the Conference National title, making 32 starts and scoring an impressive eight goals. At the end of the season Jones signed for League One side Stevenage on a free transfer before returning to Mansfield a year later.